Picasso needs no introduction. If we think in painting, we are probably going to think in Picasso alongside other great Renaissance artists like Leonardo and Michelangelo. If we think of why Picasso is considered one of the most important, the answer seems relatively simple: because he was the most complete artist of all. Picasso showed extraordinary talent for painting very early. As a teenager, his drawings were at the level of the great French classicist, such as Ingres or David. Another characteristic of the Spanish artist was his constant experimentation: Picasso never pigeonholed himself into one style or movement, or even in the same type of art. He went through a blue period, a pink period, a Cubist period (movement he founded along with Braque), a more classical period, and finally, a surrealist one. Apart from painting, Picasso worked sculptures, ceramics, lithographs, and even rugs. His works of art sum more than 50,000, which made him the most prolific artist of all time. Whether one likes his work or not (I personally don´t), we have to recognize the genius of this artist. I’m not going to do a comprehensive study on Les demoiselles d’Avignon, because there are entire books analyzing this painting, so I’m just going to briefly review its most important aspects. Picasso was 25 when he finished the canvas. Contrary to what many think, the picture has absolutely nothing to do with the city of Avignon in France. 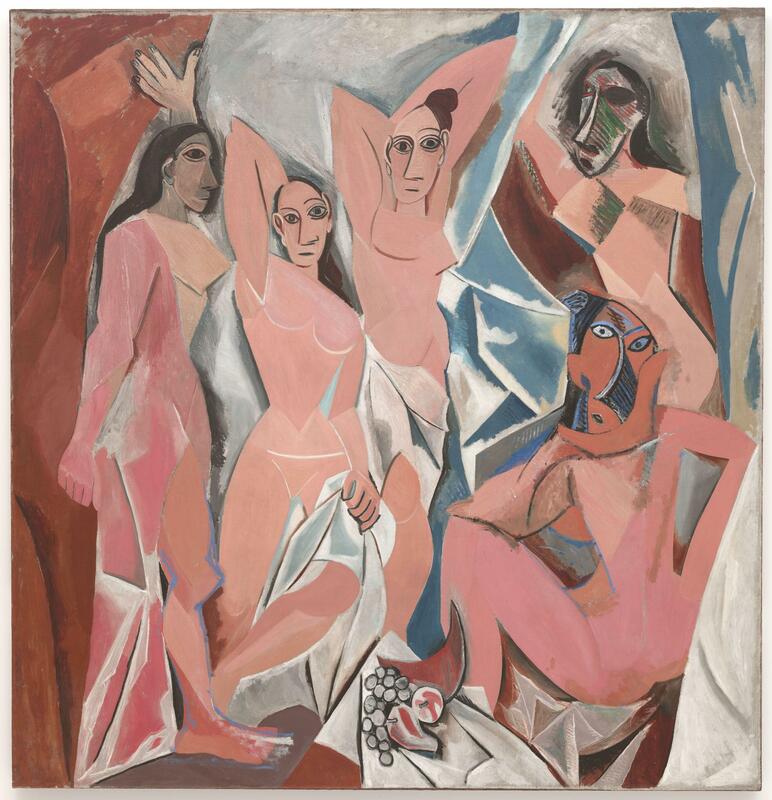 The correct name of the painting (which was not titled by the artist) was “Les demoiselles d’Avinyó”. This was a street full of brothels in Barcelona, Spain. As Picasso lived in Paris, and only his closest friends knew about this place, the French gradually started to pronounce “Avignon” instead of “Avinyó”, and the name stuck until today. The scene of the painting, without any doubt, portrays the interior of a brothel in Avinyó with 5 prostitutes. With a quick look at the painting, we can see that this painting is rough, incomplete, without any display of virtuosity. It is even ugly. But all this was carefully planned by Picasso, who never left anything to chance: the artist made 800 studies before finishing the painting. That is, he sketched 800 times the composition, the characters and the elements of the work. Nobody ever made so many sketches for a single painting. Many analyze the influences Picasso had for painting the canvas. Some say that the masks of women on the right are African, others say that the artist was inspired by the Iberian primitive painting, while others argue that the complete eyes of the woman on the left, in profile, are taken from the Egyptian tradition, and there are some who believe that the bright flat colors were copied from the French fauves. All this can be true or not, but it seems completely irrelevant. As we saw above, Picasso was not an improvised. He may have been influenced by all these sources, but used them to create something new. This creation was what provoked Cubism, a new territory to explore in art. When Picasso showed the painting to his inner circle, many rejected it. Most of them were horrified and others even laughed at the artist. Only few friends supported him. In fact, the painting was not exhibited until 9 years after its completion. But what was that caused this kind of rejection? Naked women have been portrayed since we were fighting with the Neanderthals, so it is impossible that this has caused such a stir. May have been the motif of the brothel and prostitutes? Neither. Many artists had worked these same motifs before, from Titian to Toulouse-Lautrec. So, what was it? Les demoiselles d’Avignon is different in the the way to portray the characters: if we think of the content, we see that these women do not interact. They are not doing anything but passively offering themselves to the viewer. As objects. Picasso’s painting portrays women emotionless for the first time in history. The “ladies” have no charm, no warmth. They are not happy, but they are not sad either. They are just staring disturbingly at the viewer. This was revolutionary: with a single painting, Picasso strips the Sublime from art. On the other hand, the faces of the women on the right are transformed to a point beyond recognition. While the one above seems to wear a mask, the face of the woman at the bottom is broken down, disintegrated (in a future cubistic way). The artist here does not distort reality, or express it in a particular form. He does another thing: paints something that was never there, reacting against the natural tendency in art towards realism. That is why all the critics agree on the importance of Les demoiselles d’Avignon as the starting point for modern art. ~ by Álvaro Mazzino on May 4, 2012. Thanks. This is a good description of the painting. These companies keep increasing their prices which makes the resell value good. So it’s a cycle that’s hard to break. There might be an exception, but so far, I don’t see these two brands losing general appeal. If previous collabs are any indication, these two styles are only a few of the sneakers that will be included in this season’s range. The latest Palace x adidas Originals collection drops on May 21. This entry was posted on May 4, 2012 at 17:38 and is filed under Cubism.You can follow any responses to this entry through the RSS 2.0 feed.You can leave a response, or trackback from your own site.